Ian Ross makes art that has a lifespan as long as a tide. 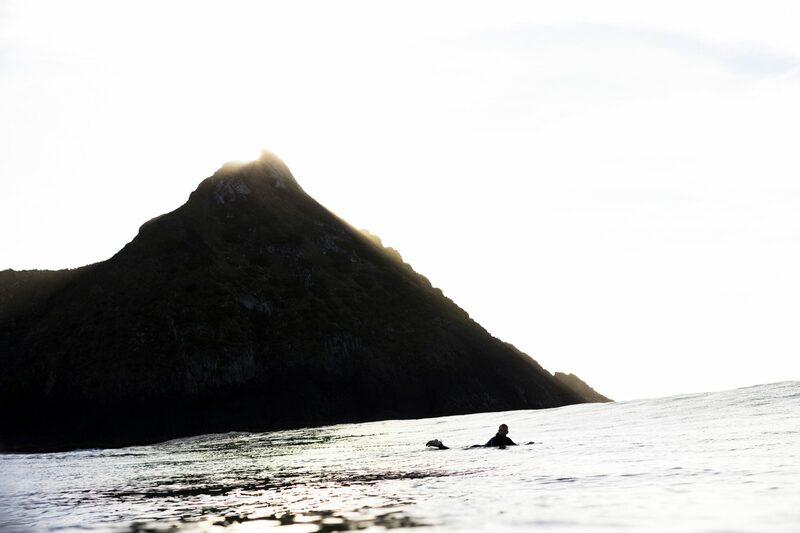 And that doesn’t faze the talented surfer and nearly 40-year-old Californian artist. 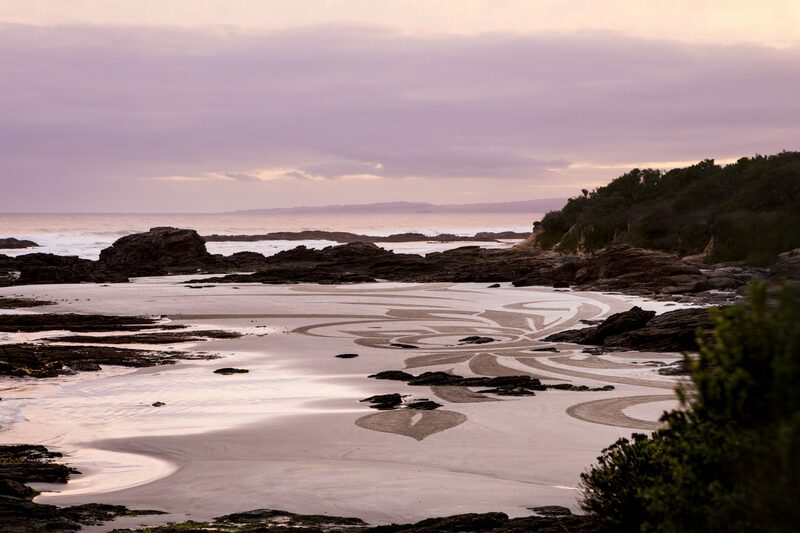 Sand art, as he describes it, is a series of shapes etched with a rake into the intertidal sand zone. Ian is a master of it. He first saw locals raking the sand at his home break: Ocean Beach in San Francisco. Ian bought a rake and fell in love. 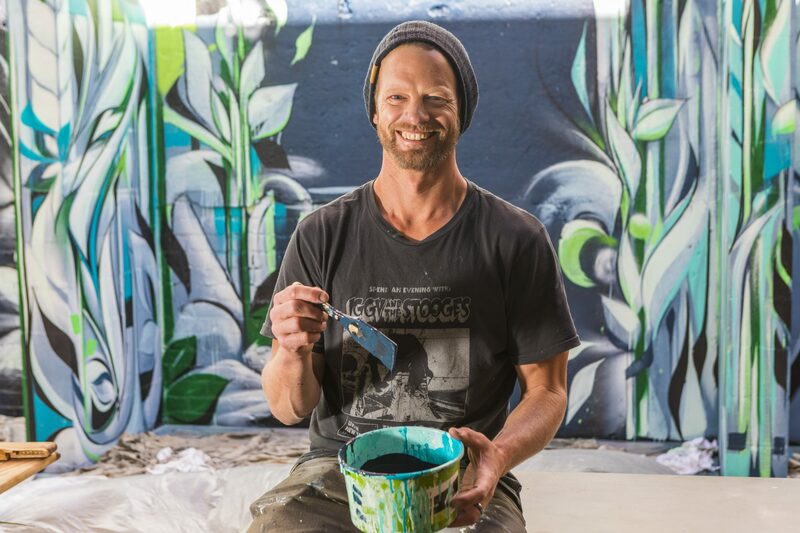 We met Ian and his wife and business partner Daniele at the Heritage Café on Vogel Street in Dunedin where he was putting the finishing touches on a mural of vines that curl across the outdoor dining space. 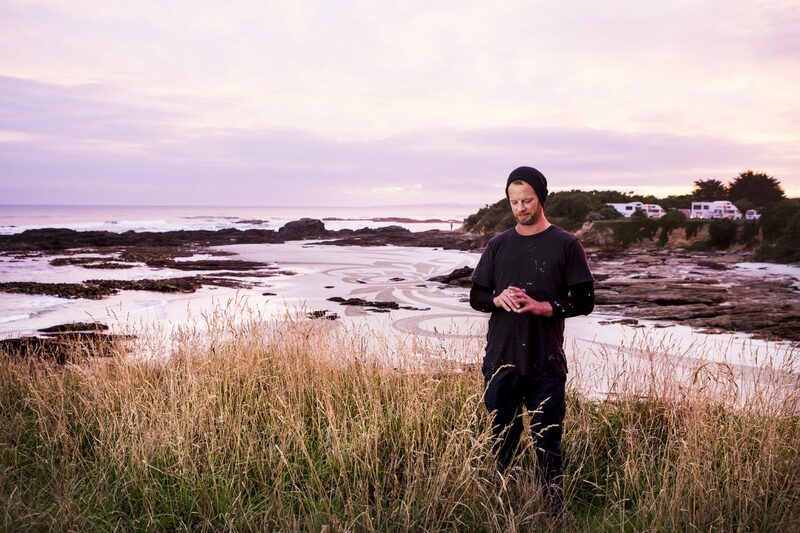 He’s in New Zealand to celebrate his good friend, Damien Van Brandenburg’s marriage to Ash, “and for the exceptional sand art conditions”, he laughs as he rubs his paint-splattered hands together. 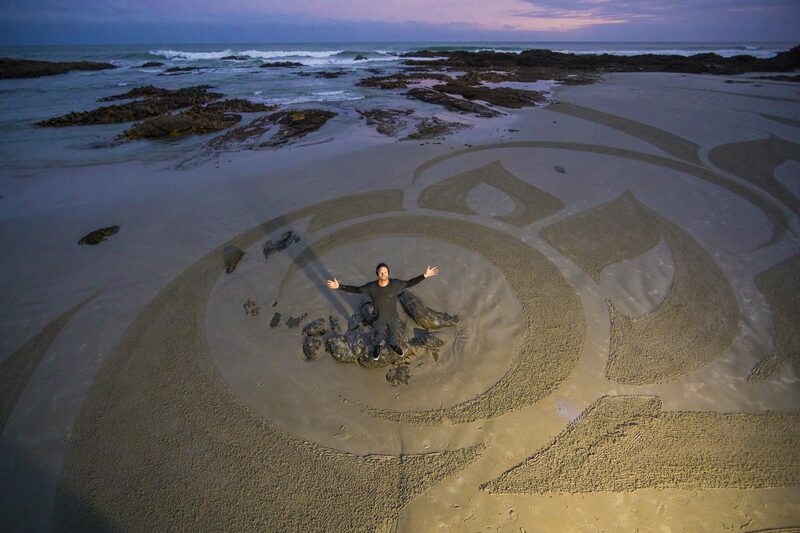 Ian said he hoped his beach art would draw attention to all the issues affecting our coastlines and oceans. 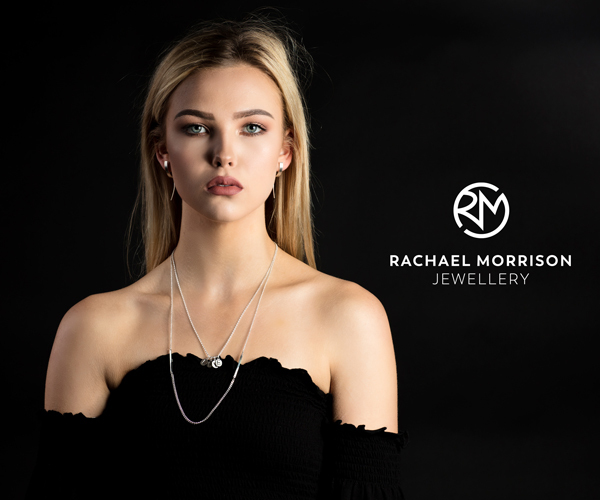 I’m attracted to this quick, beautiful process – no one can own the work, it’s gone in a couple of hours and it’s just all about the pure creative moment. Ian said he was always looking for ways to take that further. He planned to start making books and prints with the sand art and donating proceeds back to those working to protect the areas where he did the art. Ian pauses and surveys the mural inside the café. He soon finds a natural rhythm with the paint brush in a leafy corner. He appears to go into a trance as the creative pulse takes over. “When I’m working I just try to get my mind out of the way and just react to the work and to the spatial arrangements of the shapes,” he reveals as he mixes up another palette. “I’m always trying to find a balance. Like when you’re out hiking and you come around a corner and there’s a waterfall going into a bunch of boulders and there’s a tree growing out of one of the boulders somehow. It has found this way to fit into this odd spot, but it all makes sense. That’s what it feels like when you’re out in nature. I try to get my work to a place where those forms are fitting in with all the other forms. There is no right answer – it is all intuitive. There’s something about witnessing something beautiful in nature – you understand that it is beautiful and balanced and grown to be there. If I can get my work to do that and to give that calming effect then that is a successful work. He said it was the same on the beach, but simplified. He said the beach art had taken him a long time to understand and he had to learn that less was more. The Heritage Café piece he estimates is probably about a five-day piece, but by the time he’s factored some sand art and some surfing into his days it will require more than a week. 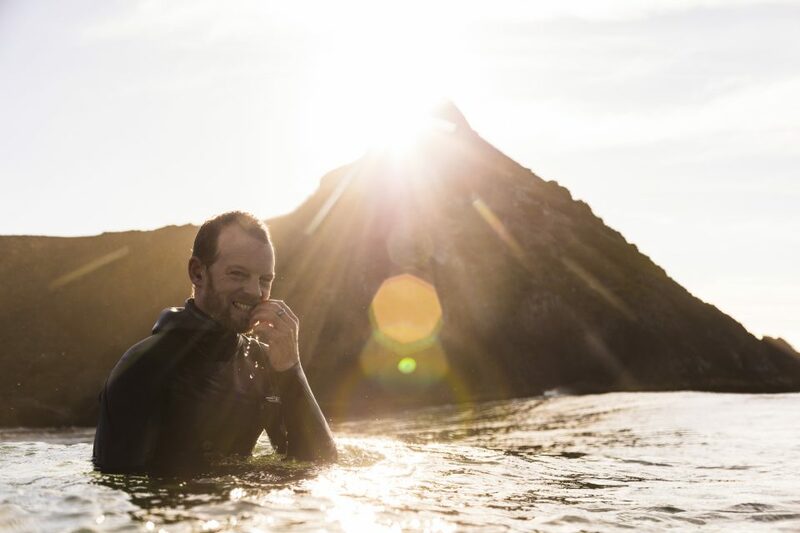 For the past 25 years, Ian has been chasing the best and most interesting waves he can find. 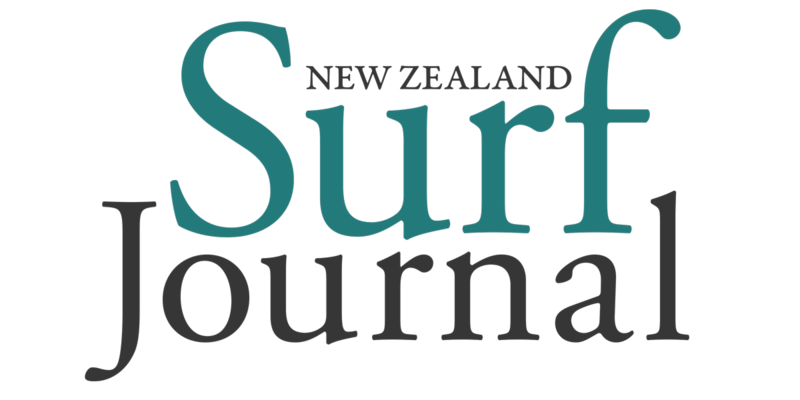 New Zealand has always been on his radar, but this is his first visit here. Ian’s left eye is blackened with cut marks in a couple of places like he has been brawling between brush strokes. It’s self-inflicted he insists. 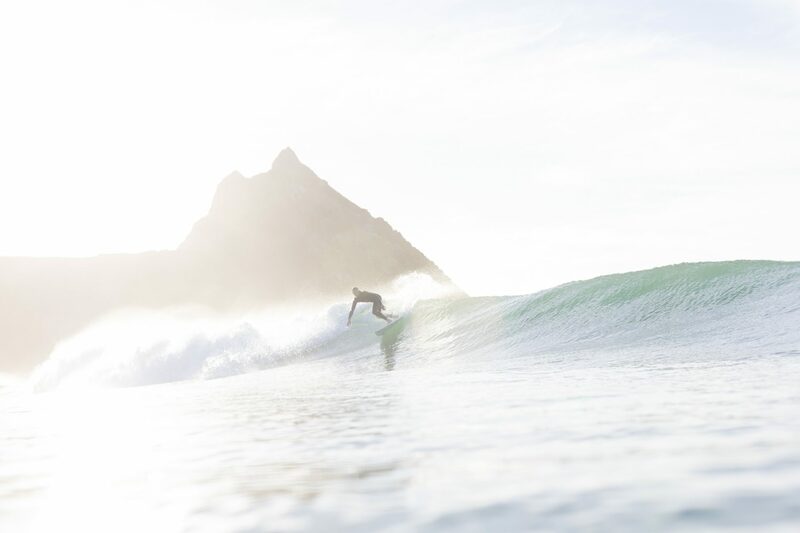 Whenever I am surfing a new spot it is an epic feeling – whether it is going off or not – it’s just nice to experience a new surf zone and learn the geography, winds and to get an idea of what is possible for the waves. That’s always rad. A third generation artist, Ian said that never put any extra pressure on him. Ian has made art his whole life, but didn’t start painting until after university where he did a BFA in Ceramics. He said that was how he liked to work. “That’s why my stuff looks like plants I guess,” he admits with a chuckle. Nature was never far away in his early years. But it was the city that implanted a deep-rooted fascination for street art. He said San Francisco had changed a lot with the tech influence and that had been a big part of his career as well. I think the gesture of the human body is a way for us to be closest to nature. It’s to do the most natural thing that our body wants to do. I think that is where a lot of graffiti, calligraphy, line work and brush work is linking us to how forms grow in nature. That’s why my stuff looks like plants I guess. He said a lot of the start-ups and tech companies wanted to embody the energy that big companies like Facebook and Google brought to their work environments. 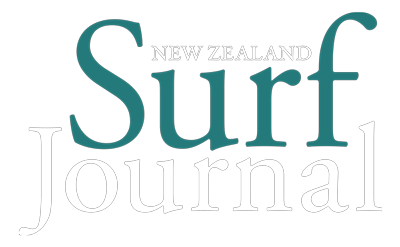 A Dunedin architect with Architecture Van Brandenburg, which holds a philosophy that design should be led by nature, Damien held his Unfurling exhibition in Ian’s gallery space in San Francisco in 2015. The two soon discovered they were on the same wavelength. If Ian has his way then the future will bring more consideration for the environment. To follow more of Ian’s work jump on to Instagram and follow @ianrossart. Ian would be the most inspiring person I’ve ever met with a rake.